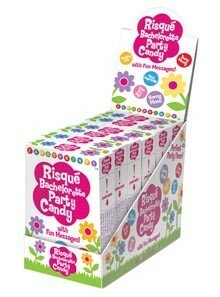 The funny sayings on these tasty treats will bring smiles and giggles to any Bachelorette Party. 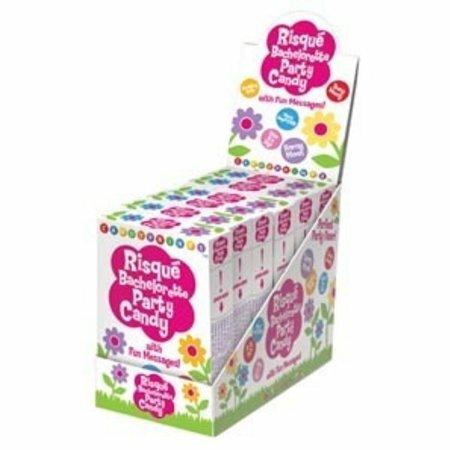 Ingredients: Dextrose, Maltodextrine, Malic Acid (E296), Calcium Stearate (E470) Resinous Glaze (E4702), Natural and Artificial Flavors, Tapioca Dextrin (E1400), Carnauba Wax (E903), Colors include: Yellow 5 & 6 (E102 & E110), Lake Yellow 5 & 6 (E102 & E110), Red 40 (E129), Lake Red 40 (E129), Blue 1 (E133), Lake Blue 1 (133). $3.00 per individual 1.6 oz. box.